BRYAN EATON/Staff photo. Army reserve Staff Sgt. Joe LeBlanc, left, and navy veteran Bill Burnham and other volunteers look through Valentine cards for appropriateness at Amesbury Chevrolet for Heart to Heart program. 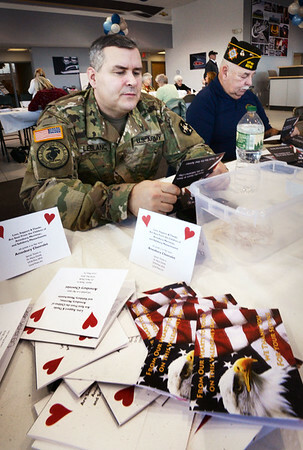 The cards are collected around town at institutions as schools and are sent to injured service members at the Walter Reed Hospital and other places.